It’s has been quite a rollercoaster of year! Sometimes painful, but really awesome. And man, I’ve learned a lot! It was a kids, kids, kids year. For those who don’t know, I have twins (a girl and a boy). The mum and I are lucky parents. The babies are healthy, calm and cute. And we survived the first year! But, they nonetheless need to be taken care of… A LOT. And I have to admit, I did not evaluate the amount of time very accurately…I’m not hiding behind these two little humans but I thought they would at least leave me a little more time to write and do stuff. It was definitely not the case. So, I had to cancel or postponed projects. Sorry for the delay, the disappointment and the inconvenience for letting some of you down. That was not the plan, that was tough and I should have communicated more about the time issues. I also had to cancel meetings or stuff planned weeks before at the last minute, especially role playing games with old friends. Sorry about that guys. Let’s meet again in 2018 (I can’t be sure about anything before that), and make Isidore Pumplewick, my life-long alterego, great again. Last year, I’ve also learned what “family first” meant to the point of losing yourself. I’ve learned the feeling of not having time for anything that matters to you. Or you thought it mattered. But what a cool year it was! Seeing my wife, the kids and I growing as a family! Seeing Alice and Victor grow, change. The first smiles, the first attempt to communicate, the first laughs, the first interactions, the great family times… those feelings were worth everything! On the writing part, as you may have understood, I did not do much but I have been to great cons. A beautiful event near Nice, South of France, in july and a great con in Belgium in december to mention only two. So now, 2017, what can we expect? I’ve decided to go one project at a time. 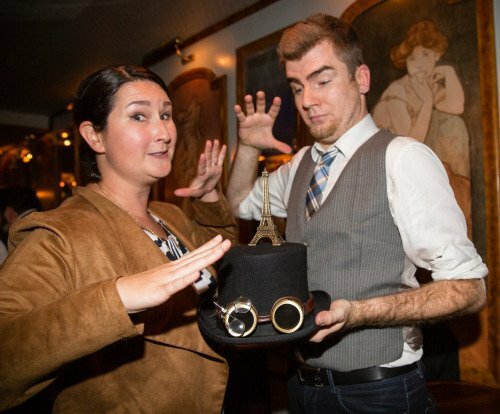 So first half or so will be devoted to Steampunk Paris, a steampunk tourist guide, with Selena Chambers for Pelekinesis (my first book in english). And after that, we’ll see, but probably a fiction or the french version of the guide. Becoming vegan, for so many reasons. More scheduling of the writing. Hopefully more reading and traveling. Oh and of course more stuff on this (new) blog. Take care of yourself, dear reader, live your life and enjoy every bits of it.